Echinacea Echinacea angustifolia and Echinacea purpurea are very commonly used to help support the immune system. Some of the other names these herbs are known by are Black Samson; Black Sampson; Black Susan; Comb Flower; Hedgehog; Indian Head; Kansas Snakeroot; Missouri Snakeroot; Narrow-leaved Echinacea; Narrow-leaved Purple Coneflower; Pale-flowered Echinacea; Pale Purple Coneflower; Purple Coneflower; Rudbeckia; and Scurvy Root. These are actually two different plants though they have very similar properties and are both wonderful for the immune system (unless you have an auto-immune disease or are taking immunosuppressant drugs). Typically I have seen the root used in the angustifolia variety and the aerial parts used in the purpurea variety, though the roots and aerial parts are useable regardless of which variety you have. Echinacea is actually part of the daisy family and is native to North America and found growing wild in prairies and open wooded areas. It is a biennial, but depending on climate may be treated as a perennial. It’s hardy in zones 4-9 here in the U.S. (You can find what zone you are in here: http://planthardiness.ars.usda.gov/PHZMWeb/) The angustifolia variety seems to prefer higher elevations with colder winters while the purpurea variety likes the lower elevations where winters are warmer. Echinacea grows to be anywhere from 3-6 feet in height with a 1-3 foot spread. Plant the seeds once the soil has reached 55 degrees fahrenheit in the spring. You can actually just drop the seeds on the surface of the soil, and once you start to see them beginning to germinate cover them with with about 1/8 inch of soil. They do grow fairly quickly, and as they start to grow you will want to thin them to about 18-24 inches apart. You can cut the stems back if you like to promote more flowering. Deadheading will prolong flowering, though they do flower from about June through October time frame. Echinacea was widely used by the North American Plains Indians and by the 1930’s it had become popular in both American and Europe as an herbal remedy. Some Native Americans called it "Elk Root" as they had learned about the plants properties by observing the elk, who would eat the plants when they were sick or injured. Today Echinacea is used to help accelerate recovery from many types of bacterial and viral diseases and some use it as a preventative as well. Echinacea seems to enhance numerous aspects of the Immune System, making it one of the first things most herbalists turn to at the first sign of illness creeping in. Other uses: It is also used as a mouthwash which may alleviate gingivitis, periodontal disease and mouth ulcers. It has been known to increase the body’s red blood cell count and may improve the function of red blood cells. Echinacea may alleviate many respiratory tract infections and sinusitis as well as accelerate the healing of a sore throat. It has been used to accelerate the healing of various skin infections (caused by bacteria) and tinea (athletes foot, jock itch and ringworm are all caused by a fungus called tinea). 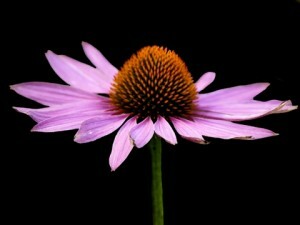 Cautions: Echinacea (regardless of variety) should not be taken with Corticosteroids or Immunosuppressants. According to the PDR for Herbal Medicines 4th Edition, Echinacea may interfere with the effects of corticosteroids and due to having immune-stimulating effects it may interfere with immunosuppressants.